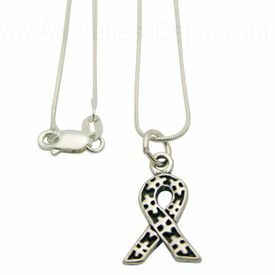 Autism Ribbon Charm Sterling Silver Necklace features our popular Autism ribbon charm that has puzzle piece designs within the ribbon on a Sterling Silver snake chain. This necklace is a lovely addition to your wardrobe and makes a great fundraiser. Dimensions: Width 0.52" Height 0.83". .925 Sterling Silver 1mm snake chain is 18 inches long.